A WOMAN WHO is faced with a terminal cancer diagnosis has told the High Court that a doctor did not tell her about a 2014 audit that found her smear tests had been incorrectly reported. Ruth Morrissey, a 37-year-old who lives on Schoolhouse Road, Monaleen in Limerick, has said that smear tests carried out in 2009 and 2012 were wrongly reported as normal. 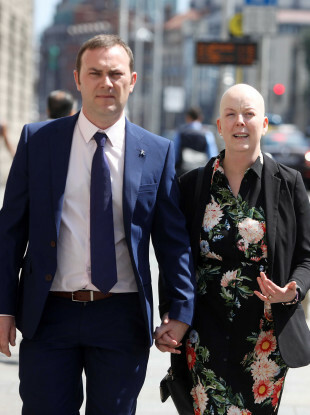 Alongside her husband Paul, Ruth has taken a High Court case against the HSE, US-based lab Quest Diagnostics and Irish firm Medlab Pathology Ltd. The couple have a seven-year-old daughter. Morrissey’s cancer recurred this year, and she has been told it will progress to terminal within a year. Her lawyers have argued that failures to correctly report previous smear tests resulted in devastating consequences for the Morrissey family. Mr Justice Kevin Cross has already refused an application from the laboratories to adjourn the case until the autumn. She began giving evidence to the court yesterday, and continued today. The CervicalCheck controversy came to light in April, when Vicky Phelan won her High Court case for damages over her missed cancer diagnosis. After an audit, it was found that 221 women had a smear test incorrectly read. It was also confirmed that 18 of these women had since died. Ruth Morrissey told the court that when she heard Phelan on TV, she believed straight away that she had also been affected by a missed test. She today described a meeting with her doctor in May of this year, and said: “He explained there was an audit in 2014. He showed me the pieces of paper in my file that indicated two of my previous smears were incorrect. I didn’t know the details. I was kind of surprised. One maybe, but two – I was taken aback… He apologised that he forgot to tell me. She also said the doctor said that the only reason he told her about this incorrect smears is “because he had to”. Also giving evidence was her husband Paul. This is how he described that meeting: “here was another family also present [in the waiting room]. They were looking at Ruth. You knew they were thinking the same thing we were thinking. [The doctor] asked us to go in and explain what had happened. It was awful. I couldn’t even look at him. When you hear someone say in 2016 they never told you, he never once told us that this was the case. If only in 2016, he had said ‘Ruth we’ve had a couple of smears come back here’, it mightn’t have been as big as it was. It wouldn’t have been inoperable. The mother-of-one also described the physical symptoms of her condition, as she receives chemotherapy, which are having a debilitating effect on her life. Ruth Morrissey described feeling pain in her arms, pelvic area and stomach, as well as difficulty in sleeping and focusing. She also said it was no longer possible to be intimate with her husband and this was a source of great regret for her. She said: “You feel your relationship is damaged. You miss the intimacy. You know you love him so much, you feel you want to show you love him. It’s devastating. You have to dig really deep. I mean really deep… Your perspective has changed. I’m not frightened to die. Paul Morrissey spoke about how it’s impacting their young daughter. He said: “She knows to a certain extent what Ruth is facing. She’s very smart. She’s a lot smarter than me. You can see it. She’s worried. When you go downstairs and you hear your daughter say “mammy, please don’t die, don’t leave”. It’s devastating. He said that their lives have completely changed from the diagnosis and the revelations about how her smear tests, and added that it had shaken his trust. The couple have been together for nearly 20 years, having got together when they were still both teenagers. Towards the close of his evidence, Paul spoke about how he felt about his wife’s prognosis. Email “'You hear your daughter say 'mammy, please don't die'... It's heartbreaking'”. Feedback on “'You hear your daughter say 'mammy, please don't die'... It's heartbreaking'”.